Finland has benefitted “tremendously” from joining the EU, where it continues to play a constructive and active role, says Alexander Stubb on the 20th anniversary of the Finnish EU membership referendum. 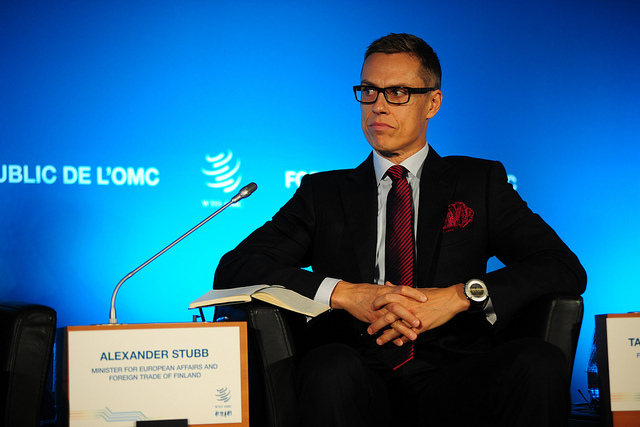 Alexander Stubb is Finland’s minister for European Affairs and Foreign Trade. He spoke to EURACTIV’s Henriette Jacobsen at the Finnish Permanent Representation to the EU in Brussels. If we look at the Nordic countries, Iceland is not a member of the EU and doesn’t want to be one, Norway is only part of the single market, Denmark and Sweden are members of the EU, but not eurozone members, and then we have Finland which stands out as the best integrated member, both part of the EU and part of the eurozone. Why is Finland the most integrated country? Well, probably one of the reasons was that during the Cold War, we were not able to integrate ourselves with Western institutions as much as we wanted. We had to find half-way solutions through a Finn-EFTA agreement for instance, or through a free-trade agreement with the European Economic Community in 1973. So when the shackles of the Cold War were released, for us membership of the European Union was as much secured politically as economically. When you live in the geographic margins of the European Union, the only way you can be in the core is by playing the game inside the institutions. We decided early on that the best way to do it is to try to participate in most forums of integration, including the euro. I think things have turned out quite well for Finland. So Finland couldn’t join the EU earlier on because basically you had the Soviet Union next to you. Do you think that other European countries understood that Finland was in the claws of Russia, but really wanted to be seen as a European, Western country at the time? Yeah, definitely. When you deal with foreign policy and you have 1,300 kilometres of border with at the time the Soviet Union which was an authoritarian, communist state and which was the main other part of the Cold War, it was clear that the West understood what Finnish foreign policy was all about. It was about survival, and I think we did quite well. At the same time, when the shackles of the Cold War were released, we emerged as what I would call a ‘Top 3’ country. We went from a ‘Top 30’ country to a ‘Top 3’ country over the span of 25 years. If you look at education, competitiveness, least corrupt states, happiness index and development index… We end up doing quite well. I want to come back to that, but first… Did it have any impact that Sweden was also in the middle of accession talks and more or less at the same stage in their membership talks? Definitely. Actually, the Swedes took us by surprise when then-prime minister Ingvar Carlsson announced the Swedish application membership. Usually, we consulted each other on these types of issues, but in this particular case, for one reason or another, Sweden didn’t do that. But we were quite far prepared and it was a logical step for us to join the European Union because we had joined all Western institutions and we had joined all institutions which also promoted free trade. So in that sense, Sweden’s step was welcomed, but we would have taken that step regardless of Sweden. I’m wondering about Russia. Did the Finnish EU membership affect the relationship with Russia? Not at all. Russia’s view of the EU is more relaxed than its view on NATO. You said that Finland went from being a ‘Top 30’ country to a ‘Top 3’ country because you joined the EU. Shouldn’t you just be bragging and say that you did this by yourselves? No, I’m not saying that it’s because we joined the EU. Nor will I say that it was regardless of the fact that we joined the EU. I think the EU was part of the big package. It was a combination of membership in the EU and a deep recession in the early 1990s which then helped us to grow. It was a combination of a strong IT sector driven by Nokia, a strong forest sector driven by our paper industry… So there were many things that actually clicked and came together, but I think we became more open and international through membership in the EU and I welcome that. You now have a voice that’s being heard on the international stage. There’s a Monty Python song from the 1980s that goes something like [singing], “Finland, Finland, Finland, so sadly neglected and often ignored…” How fair is it to say that that’s untrue today due to EU membership? I don’t base my foreign policy or philosophy on Monty Python, I must admit. But certainly, Finland punches above its weight at this particular moment and more especially and significantly during the financial euro crisis. Throughout the five-year crisis, we have been the only triple-A stable euro country. In other words triple-A stable by all the credit rating institutions. That has given us a voice which is probably louder than what it has ever been before. We also have much more say over our own currency, the euro, than we have ever before. Our currency before, the markka, used to fluctuate with the big power politics. Now of course, we are part of those politics. … 18% of the vote. How is this a true perception? No, we should remember that 57% of the population voted for membership and the rest voted against. I think the True Finns phenomenon is a Europe-wide phenomenon. The best way to explain this is NIMBY; Not In My Back Yard. We hear that a lot in the rest of Europe as well. And the key is of course to ask the question, do you change your policies as a consequence of that type of a movement and I hope we haven’t given up on our fundamental principles that the EU is a value union or political union which uses economic instruments and that we benefit from it tremendously. I firmly believe in an open, international and liberal European Union. We’ll see how the True Finns do in the European Parliament elections… They have certainly raised the debate in a different kind of way. In other countries, perhaps those that are more eurosceptic than Finland, the other parties, those that are pro-EU parties, they change their rhetoric, maybe not their policies, but definitely the rhetoric in order to show that they understand the voters and “Yes, Brussels is far away”… How has this been the case in Finland? Well, some people are trying to clone the True Finns, certainly, but I don’t belong to those. I think you have to stay true to your values and my values are very pro-European. Regarding the eurozone crisis and Greece… After Greece asked for a second bailout, Finland put its food down and wanted to negotiate better loan conditions for Finland or else the bailout couldn’t be approved. I have a Finnish friend who went to Greece on holiday last year and told me she was too afraid to disclose her nationality while she was there. How is Finland’s relationship with Greece today? Very good. My prime minister was one of the first, if not the first prime minister, to tour all the Southern countries in the middle of crisis to show his support. So I haven’t seen any problems. I, myself, was the first one to say that we do not need another Berlin wall. We have already said that and we should not create a division between the North and the South. I think it will take a little while to re-patch what was undone during the crisis, but I’m very confident that we’ll do that at the end of the day. What is Finland’s role in the EU today? I see Finland’s role being the same as it always has been; and that is that we are constructive and active… a small member state inside the EU. We believe in strong institutions and we believe in a rule-based EU. So ‘you shouldn’t blame the machine if you haven’t read the instructions’, as one could put it. It’s very important that we stick to the rules and regulations that we have set amongst ourselves inside the EU. Apart from economic policies, what are the issues that will be the most interesting for the Finns in the future? Well, we were the ones who put the Digital Agenda onto the single market agenda in the EU so that would be certainly one priority. Linked to that of course is the general liberalisation of the single market. A second issue, which we attach a lot of importance to, is foreign security policy. We believe that a common foreign security policy should be strengthened. A third area which comes to mind of course is energy policy. So we have a lot of priorities inside the EU as well. You’re now running to become an MEP. You have been mentioned as a potential candidate for an EU top job or as Finland’s next EU commissioner. Why do you want to be an MEP? Well, first of all I was an MEP for four years from 2004-2008 and now I have been a minister for six years. I felt that it’s time to participate more actively in the European debate within Finland and at a European level and the best way to do this is to run for the European Parliament. Of course it’s never democratically bad to first be elected as an MEP and then become appointed as Commissioner. But that is not something that I worry about. My target is to become an MEP and if I then later on become a Commissioner that’s great too, but I’m quite relaxed about it and I’ll go where people want me to go. You are one of the few politicians that we in our newsroom call a “Twitter champion”. I know it’s a good way to communicate with your voters, but how do you actually find time to do it? That’s like asking the question, how do you find time to think or read or write? There’s always time. Twitter is 140 characters so you have to be quite distinct in the way in which you express yourself. I sit in a lot of meetings where one can quite easily multitask. I have a wonderful Nokia Lumia 1020 which is very simple to use for Twitter. I tweet, I instergram and I facebook. And with the Digital Agenda, our internet will only become faster which will make it easier, right? Only MEP !? NO! he SHOULB BE directly the European Commissioner!! !